The heart of the Caribbean Hurricane Network are the personal reports send in by the special hurricane correspondents on the islands. Find out what happened on your favority island during the 2009 Hurricane Season by following the links below. Following is an archive of all weather discussions Dave and I posted. They are in reverse chronological order, with the most recent storm discussion on top. If you want more background information on specific storms, I have found the 2009 Atlantic Hurricane Season section in the Wikipedia a great resource. Also, visit the Hurricane Research Division of NOAA's Atlantic Oceanographic and Meteorological Lab for 'best track' data of all 2009 storms. The track map below is from that website as well. Note that reports are in reverse chronological order. It's easiest to start at the bottom and scroll upwards. Tuesday, January 19, 2010 15:56PM PST - Haiti Death Toll at 200,000! It is hard to believe, but the death toll after the Earthquake has risen to 200,000. And the situation is not getting better, maybe worse. It is a very frustrating situation. It seems that there is great difficulty to get relief supplies from the Haiti airport to the people. Doctors from outside Haiti want to help out, but the logistics of it all prevents them from gaining entry to Haiti. The numbers are also staggering, the UN World Food Program estimates that it needs 100 million prepared meals to help the Haitians for the next 30 days. There seems to be a general lack of information dissemination to the Haitian people which is only leading to more frustration... We can help somewhat by donating, please do so! Some updates I get from my Haitian hurricane correspondents are posted here. Wednesday, January 13, 2010 20:17PM PST - Text Money to Haiti! Friday, January 1, 2010 08:50AM PST - Happy New Year! Ida has weakened but is still a tropical depression. It has dumped a lot of rain over Nicaragua and Honduras, but so far no casualties have been reported. That's good news. Henri is now a non-entity, having lost his battle with the hostile forces of wind shear, our protector the last few months. However, there is still plenty of moisture in the atmosphere and, combined with an approaching tropical wave from the southeast, and warmer than normal temperatures for October, the dynamics are in place for scattered showers and a few isolated thunderstorms across the Northern Antilles later today and tonight with lingering effects tomorrow morning although it won't be as wet as was originally forecast. A trough rapidly digging south will also help push moisture through the area. In addition, the Southern Caribbean will experience some breezy winds and much needed rainfall from that same tropical wave, followed by a light area of saharan dust. Behind that is a rather broad tropical wave in the central Atlantic which, of course, will bear watching over the next few days. The good news: The holiday weekend will be much better weather-wise than originally thought thanks to the demise of Henri. The bad news: hurricane season is not over YET! The day dawned quiet but hazy as a layer of Saharan Dust returned to the area bringing filtered but pretty sunrise over St. John this morning. Volcanic ash from our friend in Montserrat is staying well to the south of St. Croix by 50-75 nautical miles so that is not a factor. TS Henri, just like his predecessor Erika, has been doing serious battle with 20-25 knots of upper level wind shear and it appears Henri will lose this battle rather soon unless the center can again be encircled with convection. With his center partially exposed to the southwest, a decrease in intensity has been noted along with a possible false center spinning off around 18N as evidenced on recent satellite imagery. The11 am advisory has Henri COC (Center of Circulation) at 18.9N 57.4W or around 375 miles to the northeast of Northern Antilles. Current wind speeds are 45 mph sustained with 55 mpg gusts with the serious convection and winds to the east and north of the COC. A high low pressure of 1007 mb also is indicative of a weak system. Additional weakening is expected as Henri should lose his battle and thus the war with the concerted wind shear assault. Current track thoughts show Henri continuing a WNW track for the next 12-36 hours followed by a westerly trek after Saturday. We can expect showers, some isolated thunderstorms and waterspouts, and increasing seas as Henri treks north of us probably as a tropical depression which would spread his effects out further from the center. The strength of building high pressure after Saturday will dictate the extent of rainfall and potential flooding for parts of Puerto Rico, Haiti and the Dominican Republic. It must be noted that wind shear is expected to lessen early next week in which it's possible for Henri to mimic a Phoenix and regenerate!! Time will tell. Meanwhile, a wave several hundred miles to the southeast of Henri bears watching over the next 24-48 hours for the southern islands. Has some potential and bears an eye. The next wave is coming off the African coast and also bears an eye. Season is not over folks!! Earthquakes to the south near St. Barts and a large, disorganized, split tropical wave off to the east are the converstaion pieces this morning! A 4.5 earthquake on the Richter scale was felt by many in the French and Dutch islands yesterday shortly after noon. No injuries have been reported so far. For the details, please check out the posts to the from St. Maarten/St. Martin and the other islands. Most earthquakes are not felt in this region but there are many and we live in a very active earthquake zone. Sadly,not much attention will be paid to these until the next big one hits when it will be too late. And we are way overdue for that. Of more interest to most of the Caribbean is Invest 91L around 920 miles off to our east. It appears to have a split personality with the low around 16N and 50W. Currently, it is moving to the WNW near 15 mph. While conditions at the moment are actually pretty ripe for development (low wind shear in the immediate area, nicely warm SST's, and a lack of intruding dry air) this sytem isn't going anywhere quickly. The NHC says about a 50% chance of Tropical Depression development in the next 2 days. SHIPS intensity model brings it to weak tropical storm status is 2 days as well but then falling back off due to the hostile wind shear over the Caribbean and Antilles which has been our protector for several months. Track models vary of course as they have a hard time with systems not developed. Current theory is the the low pressure trough to the north will not pick this system up thereby allowing subsequent building high pressure to force it due west or even southwest. This means a very wet middle to end of the workweek. After a return from the great Northwest USA, I come back to the tropics with a pensive eye. In the ever active Pacific, we have Typhoon Parma west of the Phillipines, and Super Typhoon Melor with winds an estimated 165 mph! The satellite image shows almost a perfect pinwheel and Melor is a force to be reckoned with! In addition, the Pac Rim throws in another earthquake this morning off the coast of Indonesia. Our thoughts and prayers go out to all. Here in the Caribbean, September was super duper quiet, especially considering the last 10 years of activity. Not only quiet, but dry. That is proven by the high amount of water truck activity! However, that looks like it's about to change quite rapidly starting tonight. A tropical wave along 52W has consolidated overnight and looks to be heading directly towards the northern Antilles over the next 12-24 hours. While it is forecast to lose much of it's punch due to our ever protective upper level wind shear, I'm not so sure. Rain soon come!!!! Widespread flooding should not be an issue but isolated pockets will occur. The next wave, currently around 37W, has blown up considerably and occupies a large area of the central Atlantic basin. It actually is more impressive than some of our earlier systems, at least on infared satellite. Once again, upper level wind shear is keeping this system at bay. Still, it should bring considerable rains later in the upcoming week. While development of either of these systems is unlikely, they cannot be discounted entirely. Remember, Erika survived for quite some time in such a hostile environment! Saturday, September 19, 2009 08:41AM PDT - 98L going north? It's been 10 days that I last wrote something, quite unusual for mid-September. Hope it stays this quiet. Invest 98L, now about 1200 miles east of us, looks a bit more threatening. The National Hurricane Center gives it a high chance that it will become a tropical storm in the next two days. It will be named Grace then. Since conditions ahead don't seem to be to conducive for strengthening it doesn't look like it is going to be a big storm. Also, most computer models steer it to the north before it reaches the islands. So it doesn't look too dangerous. The remnants of Fred are also still around, just east of the Bahamas, but at this point it is not expected to redevelop into something. Friday, September 11, 2009 18:52PM EDT - Quiet but? Just a quick note to mention the quietness we are experiencing at the historical height of hurricane season. TS Fred is almost dead and probably will meet his demise early next week but his remnants will continue on towards the southern US coast. The next wave has exited the African coast with potential like many before and plenty of vigor to go along. We'll see how this this wave interacts with the environment ahead. Some models indicate organization early next week. Is Grace going to make an appearance? If so will she chase Fred's coattails or will she strike out on her own? Only half a season down folks. 1/2 to go. BEFORE SATELLITE PICTURES BEGAN IN THE 1960S. 95L is really a non-entity, having pulled northwestward and into a high shear environment and cooler waters. 96L is forecast to be turned the same way later this week but I will be surprised if this system is not declared a depression by Monday afternoon as it is a very healthy wave. There are a few more crossing the continent of Africa with development possible after their emergence but the hostile upper level SW winds across the Atlantic out around 40W would most likely snuff them out and dry air will inhibit growth as well. Not usually this quiet as we approach the historical peak of hurricane season which is September 10th but we'll all take it! The remnants of Erika have finally moved on and sunshine with blue skies are on tap for today across the northern Leewards. Just watched TWC have an interview with a senior met in Puerto Rico concerning flooding when that island is only 25% in the rain envelope while US Virgin Islands are being deluged for the second time today. Not to take anything away from Puerto Rico but TWC always ignores the USVI. The radar clearly showed the intense shower coverage we are under but never said one word about us. This is exactly why I started writing for this site 10 years ago. No respect. Slight mention. Slight. Not that anyone there would actually read this and act positively anyway. Most here in the USVI are immune to the lack of recognition. They are used to it. I, as a resident for 20 years and weatherman for 8 cannot overlook the ignorance. Currently, steady heavy rain is falling with infrequent lighting and rumbles of thunder. More is in the way from the southwest and the flash flood watch should be extended until tomorrow. This batch of rain is heavier in coverage over the territory than this mornings. The ground is saturated and roads were flooded with runoff into the ocean and guts running high. Little mudslides and rockfalls were noted earlier but more will happen tonight due to heavier rain and earlier rainfall. All dressed up and no where to go! That seems to be the case at the moment with now classified remnant low Erika who is currently swirling off to the south of St. Croix and Puerto Rico. Her convection has once again flared up and the cloud tops on water vapor are more impressive this morning than they have been in quite some time. Satellite and bouy data indicate 29 mph winds still exist but only in the NE quadrant. Regeneration is still a small possibility but first, she must survive higher wind shear ahead and a slot of dry air, also visible on water vapor imagery. Currently in the Virgin Islands, it is overcast with light rain covering most of the islands. Winds are genrally from the southeast around 6 mph with pressure falling. Some areas received heavy rain early this morning around 2:00 am with accompanying lightning and thunder but most of the rain fell over open waters. Most schools are still in session today as I've seen buses and school children on the roads. More rain, heavy at times is expected later today. A flash flood watch remains in effect through Saturday evening. More development from our train of waves departing the African coast the next week or so is very probable as they are exiting with vigor, plenty of strong convection and lower pressures. Thursday, September 3, 2009 16:51PM EDT - Finally Erika! Finally! Erika has been downgraded to a tropical depression as of the 5 pm advisory and will show little in the way of immediate rebirth due to the hostile environment ahead and the mountainous terrain of Hispaniola. This system was and still is difficult to forecast as it morphed so many times on it's meandering, slow trek to and into the Caribbean. Problem is, very heavy rainfall is still in the cards so flash flooding is still a very real possibility in the Virgin Islands, Puerto Rico and Hispaniola as it continues it's crawl westward. Like the proverbial Phoenix though, if the remannts make it across the Caribbean in some form of togetherness, it could rise again. Time will tell. Back to the east where more contenders are lined up off and on the coast of Africa. Several are very impressive and we are in the heat of hurricane season. It's not over yet!!! Please be advised of the following correction. What this means is that the port is closed to inbound traffic. Exception: ferry service can continue to run as scheduled. Please see below the latest USCG update regarding local ports. Please be advised that the Ports of St. Thomas and St. John will remain open. The ports of St. Thomas and St. John should fall back to port condition X-RAY. The port is open to inbound and outbound vessels. Facilities can continue cargo operations. All vessels over 200GT shall remain vigilant and be prepared to get underway in case the storm track shifts and/or intensifies. If vessels over 200 GT wish to remain in port they must be prepared to submit a Safe Mooring Plan to USCG St. Thomas for further vetting and approval by USCG in Puerto Rico. Ferry Services between St. John/St. Thomas and St. Thomas and the BVI can operate as scheduled. Ferry Boat operators are advised to continue to use good marine practices when determining sea state as it relates to passenger and vessel safety. The Port of St. Croix remains in Port Condition Yankee. TS Erika (she's lucky to still have the TS before her name at this point), while currently not a force from a wind perspective, will be an impressive rain producer as she crosses over the Northern Antilles. Believe it or not, there is still a chance she could strengthen a bit before she reaches as an impressive area of convection has flared up with possible circulation underneath according to the very latest hurricane hunter recon. 45 mph winds have been recorded in some areas of Erika with higher gusts and the center may have to be relocated farther to the north. Currently, scattered showers here in St. Thomas as the fringe effects of Erika start to roll in. First, to expound a bit: I usually explain the meanings of what some readers term "big words" or weather related terms after I mention them as this is not only an very informative site but hopefully, a learning site as well. Sometimes, in my haste to get information out, I fail to do that and some readers get frustrated. Even one of my sister's keeps a dictionary close at hand when she reads these! So please, accept my apology if I don't explain a term or word. Believe me, I am not a Ph.D! I also interject humor into my postings as weather can be a very dry scientific subject most of the time and I learned from being the local weatherman on TV for 6 1/2 years that humor not only entertains but keeps people interested and paying attention. I cannot be a monotone weatherman! If anyone would like to contact me seperately, on this or anything else, please feel free as my email is dave.mcdermott.vi@gmail.com. So, thank you Gert for explaining the port conditions previously mentioned. They are pretty much uniform throughout the USCG controlled ports with few exceptions depending on location. I was in haste this morning to get the information out. TS Erika is having a rough go trying to stay a named system after showing so much promise early in her career off the African coast. While the lack of organization is a big sigh of relief to the Leeward Islands, the rain many have sought will soon come down in amounts not needed so rapidly. A tropical storm watch is now in effect for the British, US Virgin Islands, and Puerto Rico. The ports will still be closed tomorrow even with the weakening slightly of Erika and probably will continue into Friday morning. The populace of St. Thomas has really shown nothing but disdain for this storm as it hasn't lived up to it's billed potential. Some have taken the necessary precautions, mainly the boating community, and the largest marina, Yacht Have Grande, issued mandatory marina evacuations earlier. My wet vac, generator, and towel brigade are ready! Right now, some seriously stiff winds and more rain than we need in a short time is in the forecast. A model or two still forecast a quick trip to hurricane status. While not out of the question, it's not likely. We have dodged another bullet with Erika as the first dodge was Bill. There are more bullets headed down the Atlantic basin pipeline with good potential for development in the next two weeks. While we have had some near misses, this is not the time for complacency to make a return. As Dave wrote before, Erika is not doing what it was supposed to do. It has been stationary for a while, but it is on the move again. Now it will go more south then earlier expected. Instead of going north of the Leeward Islands, it will go over them. It is still 'just' a tropical storm, not a hurricane, so the winds won't be the problem. However, since it is moving quite slowly and since it is quite big it will produce a lot of rainfall locally. Many islands are in the cone (see above). I know most people just focus on the center of the storm, a point, and its track, a narrow line, but if you check your closest point of approach and then overlay the map with the latest satellite image, you will get a feeling of the size of the storm and that islands even as far as Barbados are getting some weather. Zebra - You really messed up. We told you to leave. Batten down the hatches." Condition ZEBRA @ 0800 hours tomorrow. All ferry operations cease @ 1200 hours tomorrow. Once again, these times are for planning purposes only. They may be changed dependent on change of Erika's track and forward speed. A quick update: The Captain of the Port, San Juan Sector, US Coast Guard, has issued Port Condition X-Ray for St. Thomas, St. John, Culebra, and the northeast coast of Puerto Rico. All ports in St. Croix including south coast of Puerto Rico are still under Port Condition Four. 2 Sep 2009 11:51:30 -0000 - Closer Erika! Watching TS Erika stationary last night, then move a bit SW surprised many, including myself. The NHC has been fairly quiet and cautious in it's approach to this system and for a change, can't blame them. This is a perfect example of computer model inconsistencies where a disorganized tropical system is involved. Once it gets it's face out of the proverbial mirror and is ready to show out, they become much more reliable. TS Erika is anything but. As she never developed on her slow trek across the Atlantic, she has stayed farther to the south, even dipping a few times southward which has resulted in her very close proximity to the islands. Moderate wind shear is saving our you know what's once again as far as a catastrophic hit goes but flooding is going to be a real threat. I'll be disconnecting my downspout tonight as my cisterns can't take much more water and I don't want the towel brigade to be overwhelmed in my absence. Tropical storm warnings are up for the northern Leeward Islands with warnings expected to be extended to the US and British Virgin Islands and Puerto Rico later today as tropical storm force winds extend 120 miles from the poorly defined center of Erika. Rainfall amounts depend on forward speed and location. The farther north she goes, the less rain as the strongest thunderstorms are on the north and eastern side but 2-6 inches is still expected. If it's forward speed doesn't pick up and she stays a bit farther south because she hasn't strengthened, then we could be in for some serious life threatening flooding and mudslide issues. Extrapolated out the center is forecast to come within 65 miles to the northeast of St. Thomas early Friday morning. That is at current speed and center location. I expect closer than that but again, we are on the south and east sides. A bigger problem will occur if it doesn't turn at all. Currently, no Captain of the Port orders have been issued by the US Coast Guard but expect them later today. Will have analysis later as I have to work on the OT tonight. Just a quick post to mention Invest 94L is something of a Mother Nature anomaly having had all the ingredients to become a monster (and could still) but just never got it's act together. If the increased wind shear does not keep it battened down, then it still has the chance to reach hurricane status in a few days. 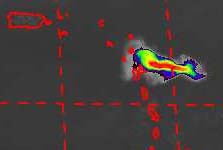 Right now, it looks like a molting octopus with it's western side being beaten down by the increase in wind shear. Still, at a low latitude, 14.6 N as of 5 pm, it's still a danger to the northern Caribbean Islands and the Bahama's. When it gets it's act together, it will not be pretty. At the moment, it is still playing hide and seek. Invest 94L didn't ramp up as fast as previously forecast, probably due to slightly lower SST's as was mentioned by some of our volunteer hurricane correspondents earlier. However, that's about to change and we could still see some explosive growth by Tuesday. Protective saharan dust is pretty much a non-entity, SST's will be above 28 degrees Celsius, wind shear is around 12 knots, and the environment is decently moist. Historically, computer models don't do a good job at all when it comes to a non-organized system so some have Invest 94L going west then NW entering the northern Caribbean south of Guadeluope as a Cat 2 hurricane in 5 days while the others push it north missing on the same track as Hurricane Bill. Personally, Bill turned a bit later than I wanted him too but that is my opinion. Once again, the longer this thing stays disorganized, the better chance it has of hitting any of our islands. I am not going to say anything about it's potential track until depression status is reached which shouldn't be too much past early Monday morning. At it's present latitude, which by the way dropped to 10.6 N from an earlier 11.1 N, and longitude, 42.0 W, and relatively high pressure at 1010 mb, it doesn't seem to pose much of a threat. As a matter of fact, I've noticed plenty of complacency lately. Not good. While we shouldn't be alarmed, we should still be vigilant. This system is a threat. Just a matter of time before it figures out who. While TS Danny continues his discombobulated attempts to organize into a viable system and threaten the East Coast, which he is still forecast to do despite himself, another contender to the throne has popped up off the coast of Africa in the form of Invest 94L. Invest 94L currently resides just southwest of the Cape Verde Islands calling 10.5 N, 25.7 W home for the moment. Moving west around 12 MPH, 94's top winds are already near 30 mph and in 5 days, according to the SHIPS model of tropical intensity, it will be at or near 93 mph, a borderline category 2 hurricane. Current climatology is very favorable for development and a major hurricane is a real possibility. Wind shear is around 10 knots, SST's are definitely warm enough and our early season savior, saharan dust, is negligible. Moist air is also out in front of this system and explosive growth is possible once it approaches the islands. Current track forecast differ as they usually do with an undeveloped storm but this one should be heading west or slightly north of west for the next several days at a slow pace which gives it even more impetus to develop. Obviously, a better handle will had by the models once a depression develops. The longer it takes to develop, the better the chance it has of hitting the islands. This one has BAD written all over it. Expect a hurricane close to the islands around Thursday next week unless a weakness develops to the north of it like we experienced with Hurricane Bill. 25 Aug 2009 19:10:02 -0000 - more invests! Following in the footsteps of Hurricane Bill is Invest 92L which has a high potential to develop into a depression by Wednesday night/Thursday morning. Model's forecast a hurricane from this but where it hits the mainland, if it does and what strength, is way up in the air. Right now it's several hundred miles north of the Virigin islands where we have lots of clouds but no much needed rain. Invest 93L over by the Central American coast could also become a hurricane. As Gert mentioned earlier, the most dangerous event from Invest 93L right now will be heavy rains over very mountainous regions. Off to the east we look and there's not alot to look at but there is a very strong wave over central Africa which could make the end of next week interesting. Another wave is west of the Cape Verde's but nothing going on right now. 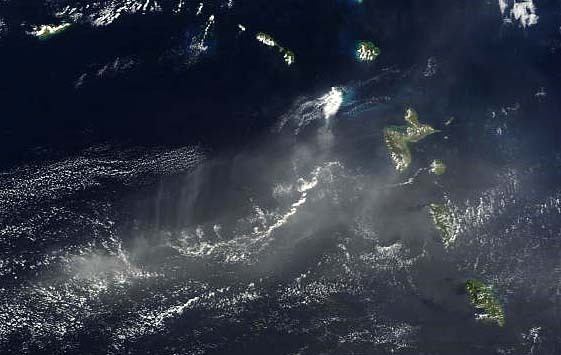 Saharan dust is still prevailing in the Atlantic basin. A slightly ragged Category 4 Hurricane Bill continues his WNW journey towards Bermuda. the New England Coast, and eventually, the Canadian provinces at a decent speed of 16 mph. Fortunately for us here in the Caribbean, Bill has decided to take his impression of a pinwheel elsewhere. Wind shear has taken a slight toll on Bill but that should not last long and Bill could even intensify more as it chugs over warmer sea surface waters. Major beach erosion will be a problem along the northern coast of the US as Bill is pushing upwards of 50 foot waves over the open Atlantic with swells expected to reach the Leeward Islands late today into tomorrow probably necessitating coastal flood and rip current advisories. Behind Bill, another impressive wave is about to exit the African coast but it will be coming off relatively high, around 15N, so should have no real impact on the Caribbean. Another reason no real impact is Bill has taken much of the moisture out of the air and stolen plenty of heat from the seas so the next system does not have many tools to work with. However, the one behind it might be one worth watching in about 10-12 days or so. We've dodged another bullet but the Atlantic is sure to keep firing so please stay alert. For those who have asked, I will not attempt to fly with the hurricane hunters into Bill as I have already been into a Cat 5 named Isabel in 2003. I'm looking for another recurving to the north storm around Cat 1 or 2 status for a better perspective on developing storms. The five day cone shows that Bill will stay clear of the Leeward Islands, the models are very good in agreement that it will go north. There are no watches or warnings posted. The closest point of approach calculator shows that the eye will stay about 300 miles away from the islands. Why am I still worried? Because it is a big storm, it might be a category-4 hurricane within 12 hours and it looks so close on the satellite images! I know, all signs tell me that it will bypass the Leeward Islands, but still, as Dave wrote earlier today, it is too close for comfort. So we have to closely track this storm to see if it really follows the forecasted path. People who should be preparing are those that live on Bermuda. For the last day or so models keep the center of Bill about 150 miles to the west, a relatively safe distance, but it is still 3 days away, so nothing is set in stone. So let's keep watching Bill, see if it does what it is supposed to do, but esp. on Bermuda, be prepared for a close encounter with a category-4 hurricane. Hurricane Bill, currently 970 miles east of the Virgin Islands, continues to strengthen as he churns towards the Northern Antilles and is expected to become a major hurricane sometime in the next 36 hours or so. Warmer SST's (Sea Surface Temperatures) of 28-29 Celsius or 82-84 degrees, plenty of moist air ahead due to Ana's quick passage, and light wind shear will all contribute to probable rapid intensification over the next 24-36 hours. First, though, it has to finish an eyewall recycle phase. Current model forecasts still turn Bill to the west northwest and eventually northwest with only 2 of those models disagreeing on general track. A trough of low pressure is supposed to be strong enough to influence this turn on Bill after 50W, well in advance of the islands thus bringing the center of Cat 3 or 4 Hurricane Bill to nearly 360 miles to the northeast of St. Thomas by around 6 pm Thursday. Tropical storm force winds extend currently out 150 miles and even if they extend 200 miles on Thursday, the only effects felt in the Northern Antilles, other than a huge sigh of relief, will be swells. Until this system is above 18N and before 62W, do not let your guard down. Weather is not an exact sceince and while we do know alot about tropical systems, theres alot we don't know. Worst case sceanrio is this defies the forecast and does not turn. Precious little time would be left for preparations and the ramifications, huge. The remnants of Ana still have another shot at regeneration over the next few days after getting ripped apart by the mountainous terrain over PR and the DR although ti wasn't that strong to begin with. Finally able to post as heavy rain has obscured the mountains forcing internet service to a halt temporarily. Downgraded to a Tropical Depression, Ana is barreling through the northeast Caribbean at a forward speed of 28 mph. This rapid pace has kept the NWS from issuing flood watches here in the territory even though isolated thunderstorms and heavy showers have dropped several inches of rain. Sometime around 9:15 am this morning, Ana will have reached her closest point to St. Croix at 54 miles to the southeast. Ports in St. croix remain closed per Sector San Juan Coast Guard orders. TD Ana is plowing into Puerto Rico as I write and should reach Hispaniola by tonight. Due to the mountainous terrain of both Puerto Rico and Hispaniola, it's unlikely Ana will retain even TD status and will degenerate into an open tropical wave by tomorrow. The rains are beneficial though as we have not had significant rainfall for quite some time. Tropical storm watches have been discontinued for Antigua, Barbuda, and Montserrat while the rest of the northeastern Caribbean retains Tropical Storm Watch status. Even Carnival Cruise Lines has saw fit to revert to their original itinerary and the carnival Victory will call on the port of St. Thomas this morning. I don't believe the passengers will have the time they thought they would though. Hurricane Bill, now classified as a Category 1 hurricane, is forecasted to become the first major hurricane of the season. Fortunately, at this time anyway. it appears Bill will trek well to the north and have minimal impact on the Caribbean. This is not to say we are in the clear yet so viligance should still be maintained. Currently, Bill is 1362 miles to the east moving WNW at 21 mph with a central pressure of 987 mb. It is expected, on it's current course, to be 385 miles to the northeast of St. Thomas around 2 pm Thursday with it's next intended victim being the island of Bermuda. It is not expected to hit the US mainland. Another vigorous foot soldier has left the African continent and their are several more lined up. Starting slow, the heart of the hurricane season is living up to it's historical billing. As I was in St. Croix for the last 18 hours without access to a computer or any other internet facility, I have been unable to update. However, I am now. The COPT (Captain of the Port). Port San Juan Zone, anticipates setting PORT CONDITION YANKEE sometime today ahead of rapidly approaching TS Ana which means vessels greater than 200 GT should be ready or already have left port in the San Juan Sector which includes the US Virgin Islands and Puerto Rico. This also basically closes the port. Extrapolated out, TS Ana, based upon her current speed and anticipated intensification, will arrive near the US Virgin Islands, south of St. Croix, around 43 miles, with the first tropical storm force winds being felt around midnight Monday. Maximum sustained winds at this time are forecasted to be 55 knots or 63 mph. Dry air is ahead of TS Ana and will serve to slow her intensification. Extrapolated out as well, TS Bill, based upon his current speed and anticipated intensification, is expected to be north of St. Thomas, around 124 miles, late Thursday night as a Category 2 hurricane with maximum sustained winds of 95 knots or 109 mph. As TS Ana moves ahead of TS Bill, the atmosphere will be moistened by Ana and leave a fertile environment for intensification by Bill. SST's are definitely warm enough to support intensification as well as moderate wind shear. Bottom line: This is no joke guys and girls. TS Ana does not appear to be a major threat while TS Bill poses a major threat. While the forecasted plot and extrapolation keep them from a direct hit on the US Virgin Islands, they are passing too close for comfort and any increase in forward speed or any wobble can put the US Virgins and British Virgins in their direct path. TS Watches have been posted already for St. Martin, Saba and Satia. And if this not enough, another large, strong tropical wave is just exiting the African coast, although a bit higher up. More tomorrow. Be safe, be smart, and be prepared! Tropical depression Two has regenerated, and has after all become our first storm of the season, Tropical Storm Ana. The good thing is that it is not expected to become a hurricane. However, it's path is more south then earlier forecasted, and it is expected to cross the Leeward Islands. It is aiming for Antigua where it will be on Monday, then as it looks right now will go in between St.Maarten/St.Martin and Saba. Find out how close it will get to you with the Closest Point of Approach (CPA) calculator. Ana is moving pretty fast, so prepare now! I haven't had much opportunity to study the Atlantic this morning but what I do know is the remnants of TD#2 will pass close by early next week with some possibilities of regeneration while a Cat 2, maybe 3 will be close by probably Thursday. Most computer and wave models have this system spinning uncomfortable close to the northern Antilles and conditions are ripe for some explosive growth after the system crosses 50W. Again, if it strengthens rapidly, it would probably recurve to the north missing the islands but the longer it takes to get organized, the better it's chances of staying south heading west and end up on our doorstep. If you aren't prepared yet or at least thinking of it, I suggest the time is act is this weekend. I'll have more tomorrow. TD#2 is still heading west but is expected to not impact the islands directly unless it fails to gain strength. A weaker storm will tend to head west and even a bit southwest while a stronger storm will almost certainly recurve to the north of the islands. Dry air is interfering right now with development so TS Ana may have to wait a bit longer to be born. As I mentioned yesterday, I really do not like the looks of the tropical wave to the southeast of TD#2. The latest runs I have seen show a large storm over the northern Antilles in about 7 days. Way too early yet for accuracy here but enough info that everyone should really pay attention next few days. If your not prepared, I suggest you seriously think about it. If it's not this one, it could be the next. Meanwhile, wave to east of islands is a fizzler with only scattered showers and maybe a few thunderstorms next 24-36 hours. TD#2 continues it's struggles with less than ideal SST's (Sea Surface Temperatures) and dry air as it moves off to the west around 15 mph. Recent computer model runs are dictating a slight northerly turn 3-4 days out as a weakness is expected in the ridge above. Climatologically speaking, storms which form this high, around 15N, so far away, tend to turn northward thereby missing the Lesser Antilles and Caribbean. However, we have also witnessed recent history where these storms didn't read the "Hurricane Diaries" or study Atlantic climatology and did pretty much the unexpected. With that in mind, it is possible for this to head due west for longer than forecast, especially if the ridge does not weaken. More interesting is the wave which just departed the African coast much lower than TD#2 and the one behind it. The invest that we have been following for the last couple of days has become better organized and how now been upgraded to Tropical Depression Number Two. The first depression, in case you missed it, formed off the coast of North Carolina, 'way back' in May, but didn't become anything. Tropical Depression Two is close to the Cape Verde islands, still about two thousand miles away from the islands. As it looks right now it is only going to reach tropical storm strength, and the track is supposed to go north of the islands. However, it is still too early too tell. If it goes a bit further south, which is not unlikely, it will be stronger, possibly a hurricane, and get closer to the islands. Stay tuned on this one. You can use the above tools to check how close the storm is expected to get to your island. The tropical wave that moved over Barbados yesterday has a low chance of becoming a tropical depression or worse, however, there will be some weather in that area. While the Pacific Basin active and destructive, the Atlantic has been uncommonly quiet. But, right on cue, that appears to be coming to an end. Invest 99L, currently hovering around the Cape Verde Islands, has peaked interest at the NHC. Latest computer models have it going slightly north of west but it is still very early in the game. Saharan dust and dry air have not been inhibiting the development of this system and it should become a depression by tomorrow morning. Sea surface temps are warm enogh and wind shear is low. How close it will get to the islands is too early to call but it should go to the north. Behind it are the rest of the wave family trying to make their mark as well. Look for some development of one of the next three over the next two weeks. There is a tropical wave out there, just south of the Cape Verde, Invest 99L. As it looks right now, it might become a tropical storm, but should travel veer out north of the islands. First, our prayers and a wish for speedy recovery for Dear MissMermaid from Tortola!!! You can read her posts on the right. Overly quiet right now. Usually I have posted numerous times already due to tropical activity but the continued presence of the Saharan Dust and accompanying dry air is strangling any wave with thoughts about becoming the first named storm of the season. And it looks like this trend will continue for most of this month. Of course, the quietness will lead many to become extremely complacent. That's a dangerous idea! So far we haven't had any tropical storms, but don't let your guard down! In 2004 for example we didn't see the first storm until July 31, but that was the same year we had Ivan which devastated Grand Cayman and Frances, a category 4 storm that went over the Turks&Caicos and Bahamas. Or for example back in 1992, when we didn't have the first storm until August 14, which was Andrew that caused havoc in Florida. Also the research team at Colorado State just issued a new forecast, and is calling for 10 tropical storms this season. However, at least the lowered their forecast a bit from their June forecast. I especially liked the following quote in their paper: "We believe that the neutral tropical Atlantic combined with a weak/moderate El Nino event will likely lead to a fairly quiet hurricane season." The new numbers are 10 tropical storms, of which 4 hurricanes, of these 2 will be 'big ones'. Normal is 9.6, 5.9 and 2.3, resp. So a bit below average. 26 Jul 2009 15:32:44 -0000 - Quiet! All quiet on the Atlantic front which is good news for all! Saharan Dust Levels with their accompanying dry air have been assisting with the demise of most of the tropical waves coming off the African coast as have the upper level winds. It's even quiet on the Pacific side where they have had 2 hurricanes already; neither affecting land. But, the end of July is here and this is where the historical ramping up period starts. Wind shear is low right now across the Atlantic Basin, SST's are normal or a bit above, and the Saharan Dust is not very thick. Plus, El Nino isn't as strong as it was forecast to be at this time. So, expect to see some action after fairly soon. Right now, a wave is around 32W with not much punch. I'll watch that with some interest for now but I am also watching the one that is just emerging off the coast. Will we see Ana by the end of the month? Doubt it. Will we see Ana is the first 10 days of August? I believe so. 21 Jul 2009 12:09:31 -0000 - Who's on first? Well, the race seems to be on. Which area will develop first? The low over the Bahama's or our very own Invest 97L which has been resilient in it's efforts to survive the intense wind shear assault at the upper levels. Moving more WNW, Invest 97L does not bode well for the Dominican Republic and Haiti whether it develops or not. Wind shear is relaxing a bit and in a few days might have limited effect on this system making development near Florida a real possibility. Time to gear up! Looking east and southeast, another wave has entered a Saharan Dust free zone around 8N 48W but is still in the clutches of the ITCZ and until it escapes that, it will not possess the ability to develop. Current track shows either a slam into the South American coastline with residuals affecting Trinidad/Tobago and the ABC islands or a more NW component in a day or so. Wind shear should still be a factor in inhibiting it's development as well. The coast of Africa should be spitting out the next foot soldier and this one will be coming off into a very dry, dust-laden airmass. It will also come off the coast pretty high up, around 14-15N so should recurve northwards. 20 Jul 2009 12:40:27 -0000 - Closer! Invest 97L is still just that, an invest, but is expected to dump copious amounts of rain along it's path through the Windward Islands. Barbados should be feeling it's begining effects and it does look like it has a more NW component. Wind shear is our only saviour at the moment as the Saharan dust, so dense last week, has virtually disappeared from the region. Sea Surface Temperatures are plenty warm enough for fueling the system but the shear continues to be a formidable opponent and one we want to see win! Last nights light show was brief but spectacular with brief downpours. The sun is making a morning appearance right now but expect that to hide as well by late this afternoon as the invest creeps closer. Finally, a wave of interest! Along 12N and 42W is Invest 97 which currently has some isolated strong convection but otherwise modest activity. Most current forecast models project an entry in to the Caribbean near Guadaloupe and passing just south of the BVI and US Virgin Islands. Development will be slow if it does due to our protective saharan dust and accompanying dry air to the north and to the west (ahead) of it. Timing for entry would be Tuesday. NHC forecasts less than 30% chance of development but that's only for the next 48 hours. Time for the complacency to end folks! Closer to home, another wave around 60W is getting beaten up by our friendly upper level wind shear. This one probably would have developed if not for the shear as it's pretty impressive regardless. Look for tonight and tomorrow to be very breezy and rough offshore with showers and a few rumbles of thunder. Development after it goes through the northern islands is possible and should be around Florida by Wednesday. El Nino is developing which usually means a less active and potent Atlantic hurricane season but that crummy one that hits you will be the only one you care about! SST's are a bit above average which is the fuel for these destructive enginesand while it's getting towards the end of July and it has been slow that doesn't mean the rest of the season will remain that way. The most active months are right on the doorstep so be diligent, check your supplies, and heed the warnings if they are issued. It's your property and your life. 15 Jul 2009 11:30:37 -0000 - 7.8! This early Wednesday morning while the Caribbean slept, a magnitude 7.8 earthquake struck just 6.9 miles below the surface off the west coast of the South Island of New Zealand or approx. 110 miles WSW of Queenstown around 4:22 am local time. Why do I mention this? We live in a very earthquake prone region, along with hurricanes and volcanoes, and we are overdue for a big one like this mornings. A tsunami warning was issued for the entire Pacific basin but most of it, including Hawaii, has been cancelled with little rise detected. I believe they are still in effect for Washington state, California, British Columbia, and Alaska. An earthquake this large can have devastating effects on land and as history has shown just a few short years ago, attack from the sea as well via the powerful tsunami. Here in the Caribbean, tsunami's are very rare but have happened and will again. Not if. Unfortunately, the tsunami early warning system is not as extensive nor efficient as it should be and with many of our islands so close geographically speaking, the earlier the warning, the earlier lives will be saved. I have not heard yet of preliminary damage reports land based. The Pacific is also active tropically with one small compact Hurricane, Carlos, 2 depressions and one invest. One of those depressions should be a tropical storm later today. Our very own Caribbean and Atlantic is still in the doldrums of summer which is fine by most of us in the region. A very weak wave, if you could even call it that, passed last night with one good shower, moved on, and it's tail end had a hanger-on: Saharan Dust. This morning the dust is thick and will be with us for the next few days which portends for mainly dry and hot conditions. Another wave is 1/2 way across hurricane alley but convection is weak. A slow start to season is good. A slow middle and end would be even better! 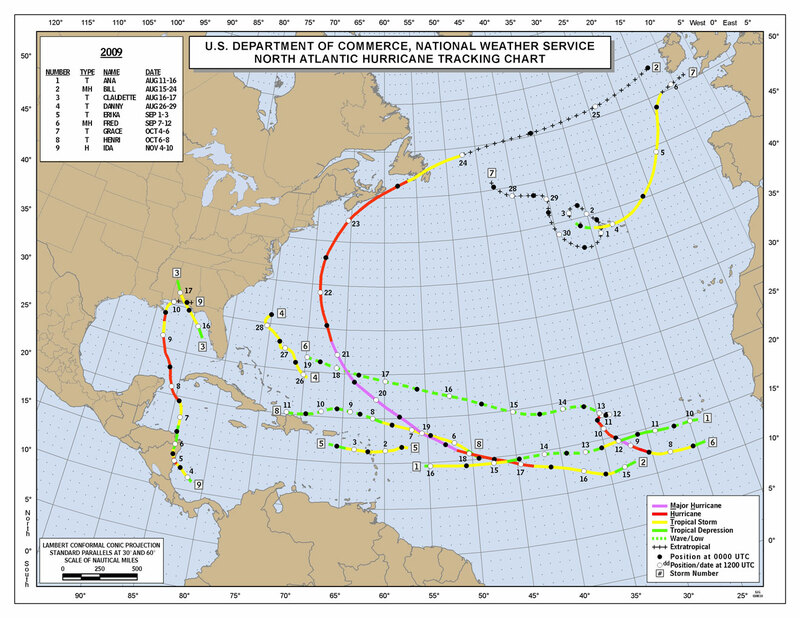 I have just updated the Climatology of Caribbean Hurricanes section. It now covers all tropical storms from 1851 through 2008 (1,410 storms total). For this I recreated about 650 webpages and 4,500 images using the latest 'best track' data available from the National Hurricane Center's North Atlantic hurricane database reanalysis project (website). Check out the detailed information about all storm tracks that passed by your favorite island, and find the peak of the season, or when the worst time to travel is for your favorite island. Furthermore I ranked each island by the number of storms passing close by to award teh price of the 'hurricane capital' of the Caribbean. Check it out at: stormcarib.com/climatology. As a quiet June 2009 comes to a close, there are no storms on the horizon in the Atlantic Basin, the Caribbean Sea and the Gulf of Mexico. The main activity we will be watching the next few days consists of a low latitude tropical wave near 51W which will impact our area probably Friday into Saturday with another patch of Saharan Dust making it's appearance ahead of this wave Wednesday night. Winds will increase as well due to high pressure in the central Atlantic shifting westward which will tighten a loose pressure gradient reaching their peak Friday as well. Sunday should be dry as the holiday weekend comes to a close as does the 2009 Carnival festival in St. John. Another active tropical wave is exiting the African coast but will diminish in intensity like it's predecessors as the waters are just too cold in that area. In addition, waves which could make it across would have to deal with upper level westerlies around 30,000 feet and the dust factor so a hostile takeover would ensue. While this may be a weather forum, it has to be said what a loss to the world yesterday with the passing of Michael Jackson, Farrah Fawcett, and the day before, Ed McMahon. Since most tend to believe things happen or come in three's, let that be the end for now. May they all rest in peace. On my way home last night, I saw the last blue fleck of sky enveloped by saharan dust and as darkness fell, the lights of Jost Van Dyke and Tortola were extinguished by the seething surge. Mind you, these islands are under ten miles away from my place on the east end of St. Thomas. This morning, all haze and dry with filtered sunlight. As is customary for some reason during hurricane season, our Doppler radar out of Puerto Rico appears to need more "routine maintenance" than normal, especially when a wave is approaching and this time is no exception. A weak wave with most of the action south of the territory is around 65W while the radar has been out since yesterday and will continue to be until June 28th according the the radar link. Does any of our readers know anything or can contribute some knowledge concerning the maintennace necessary for full operation of this unit? If so, please contribute so we will all be better informed. An alternate radar, the new TDWR High-definition radar covers about 7/8 of Puerto Rico and not much else. That shows some scattered showers to the northeast of eastern Puerto Rico and again, not much else. The vanguard of Saharan Dust is soon to arrive after our weak wave passes along with a moderate wind surge. It's looking like a sunny, hazy, hot, and pretty dry weekend. The islands are retaining their beautiful green shades as more showers than normal still find their way to our shores but this coming week might signal the end of that pattern. A large Saharan Dust cloud is meandering across the Atlantic and should impact our skies through the upcoming weeknd. This portends to hotter temperatures and much drier skies. This also helps put a damper on any tropical thoughts the hurricane gods may have for an early start to the Atlantic season, at least in Hurricane Alley. The Gulf of Mexico doesn't really realize much impact from Saharan Dust, thus it's factor in inhibiting development there is negligible. There is a new experimental dust forecast issued by Dr. Amato Evan of the University of Wisconsin which predicts below average dust levels similar to last years due to the plentiful rains over the Sahel region of Africa. The dust levels are predicted for the MDR or Main Development Region which is 8-20 degrees North and 15-65 degrees West. Interesting reading so check it out. Meanwhile, 1 tropical storm and one depression currently occupy temporary space in the Western Pacific and one TS is in the Eastern Pac off the Mexican coast. An area of interest just south of Brownsville Texas is given less than 30% chance of development but still, there's a chance. It would be good if these clusters of storms ran straight up into SW Texas and help alleviate the drought situation there. Other than that, it's pretty quiet around here (except for those helicoptor gunship mosquitos) and that's a good thing! Since I started the Caribbean Hurricane Network over ten years ago, this website has become very popular. During hurricane season this site is visited millions of times, and even outside the season many people check in to see what is happening on the islands. It has become one of the most widely used weather and community based website in the Caribbean. Today is officially the second day of Atlantic Hurricane Season. And we are all ready, aren't we? As is tradition, researchers Klotzbach and Gray of Colorado State University issued there updated seasonal forecast. The good news is that they lowered it a bit, they now expect 11 named storms (Ana through Kate), of which 5 will reach hurricane strength and 2 of them Category 3 or higher. 'Normal' is 9.6, 5.9 and 2.3, resp., so the number of hurricanes are a tad below average. Sat, 30 May 2009 17:31:59 -0400 - away! This is coming from San Diego Ca. where I am attending the San Diego Rock and Roll marathon tomorrow! Weather here is overcast with drizzle and about 65 degrees which to me is comfortable but to my co-horts, is cold! Looks to be this way for next few days. Will report upon my return but hey, hurricane season starts Monday. Be prepared! Fri, 22 May 2009 08:40:36 -0400 - Ash! Normally,�a blob the size of the one south of Hispaniola piques everybodies interest in August and September, but it's not generating that much publicity right now even though it is affecting Haiti and the Dominican Republic with lashing rains and windy conditions while giving Jamaica and the western half of Puerto Rico some shots of their own. Haiti is still in the throes of recovery from last years tropical systems downpours and several deaths have already been reported. While not forecast to develop, it's potential for more human and animal misery will continue for a few more days. The algae bloom which has plagued the region is finally dissipating. While good for micro-organisms, it is not good for coral as it blocks the sunlight and when it dies, it blankets the coral as well. Happy to see that stuff go and a return to 80 foot visibility! Seas are running 2-4 feet offfshore and even less inshore which should bode good and bad for the annual Poker Run this weekend. While allowing for safer conditions sea-wise, the expected lower seas will surely lead to several blown engines as these contestants vie for large prizes racing from island to island. Winds are expected to pick up a bit so that will be good for Foxy's Wooden Boat Regatta over by Jost Van Dyke. And yes, the mosquito population has exploded and now I am wishing for a return to January and February. My cistern is happy though! This was organized yesterday afternoon but lost internet connectivity by the ime I finished it! This morning, hazy and sunny for a change! I love it!�Within 3 hours of the NWS lowering it's percentage chance of rain from 70% to 20%, that 20% chance is now 100% and has been for about 1/2 hour and by the looks of our on-again, off-again Doppler radar out of Puerto Rico, it will be 100% for another 1/2 hour at least! The mosquito population, virtually dormant the last few months, has exploded already and they are already rubbing their wings in glee at this latest downpour. Hydrologically speaking, it doesn't take alot of rain to cause low level flooding here in the Virgins as we do not have the topsoil depth that many islands or other countries have so it can't soak in too far. Very low clouds, called patchy fog by some, myself included, shroud the mountain seperating the northside from the south. Rain is good stuff, in moderation. So are alot of other things! This weekend is supposed to be drier until Sunday night when a big rain event is possible and flash flooding is probable, especially in Puerto Rico Monday into Tuesday. May is living up to it's reputation as one of the wettest months of the year historically but many residents, while happy with full cisterns and a very green, tropical island,�are starting to "jones" for some lengthy sunshine. These last two weeks since Carnival have not been "sunny" for our tourists and many are going home as white as when they reached! Still, a rainy vacation in the Virgin Islands is better than sitting at home. The Pacific 2009 Hurricane season started today, a full two weeks before the Atlantic does. In addition, sub-tropical storm formation is a weak possibility off the east coast of Florida and near Bermuda with the one near Bermuda having a better shot.